Trachelospermum Jasminoides (Star Jasmine) is an evergreen climber with creamy white variegated leaves. 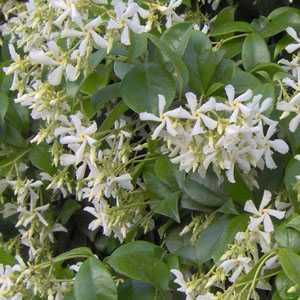 It produces very fragrant white flowers from July to August and is ideal as a trellis or climbing plant. Water plants freely during the growing season (especially container grown specimens) to ensure that they don’t dry out. Water only sparingly during the winter, allowing the surface of the compost to dry out between waterings. When growing in a south-facing conservatory or glasshouse, shade from direct sunlight may be needed to protect the leaves from sun scorch.